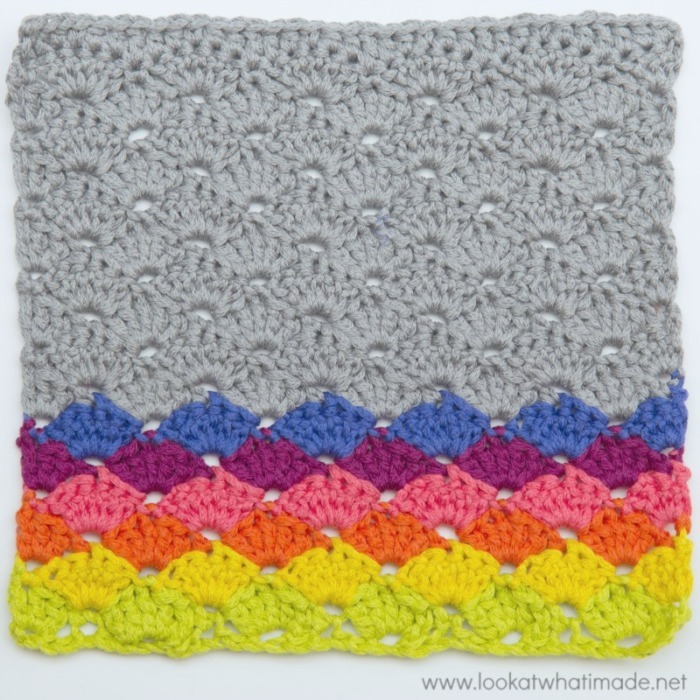 This is a quick and easy pattern for a Simple Crochet Shells Dishcloth. 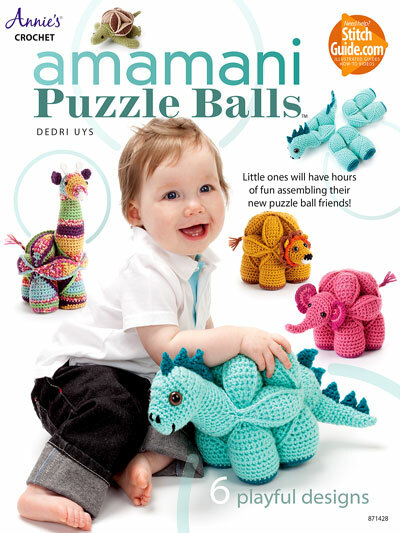 Crochet Shells are some of the easiest stitches to make and master. 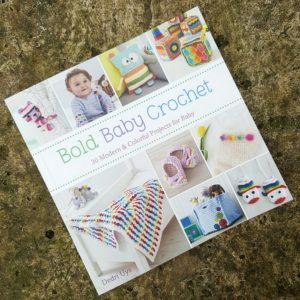 You only need to know how to make chains, single crochets and double crochets. The resulting pattern is both meditative and speedy. I have chosen to make my Simple Crochet Shells Dishcloth in rainbow colours against a grey ‘sky’. It reminds me of thunderstorms in South Africa and being able to see both ends of the rainbow over the Karoo ‘vlaktes’ (plains). There is something so cozy and nostalgic about an overcast grey sky and rumbling thunder. Rainbows, on the other hand, make me feel light and happy in a completely different way. How do they make you feel? Gauge is not important for this pattern. 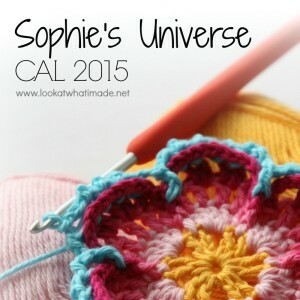 That having been said, I get just over 3 waves and 10 rows per 4″ (10 cm) square. Scheepjes Bloom (worsted weight/#4) in 7 colours: French Lavender (402), Peony (405), Geranium (408), Gerbera (413), Sun Flower (414), Tiger Lily (415), and Grey Thistle (421). 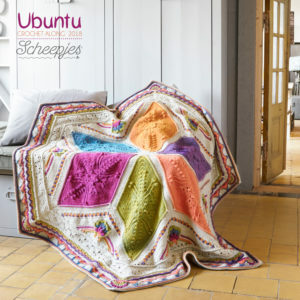 Scheepjes bloom is available HERE from Deramores and HERE from Wool Warehouse (Internationally). 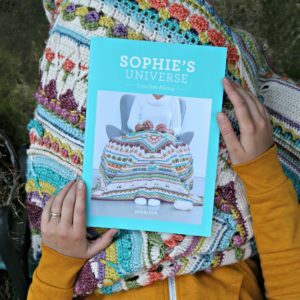 You can also buy it from Scheepjes directly (Netherlands). * Repeat the instructions between asterisks the amount of times specified. 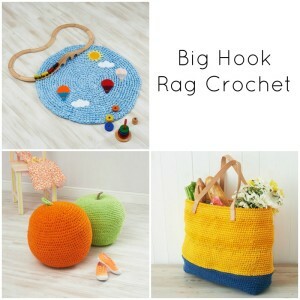 You can add this pattern to your Ravelry Queue HERE. 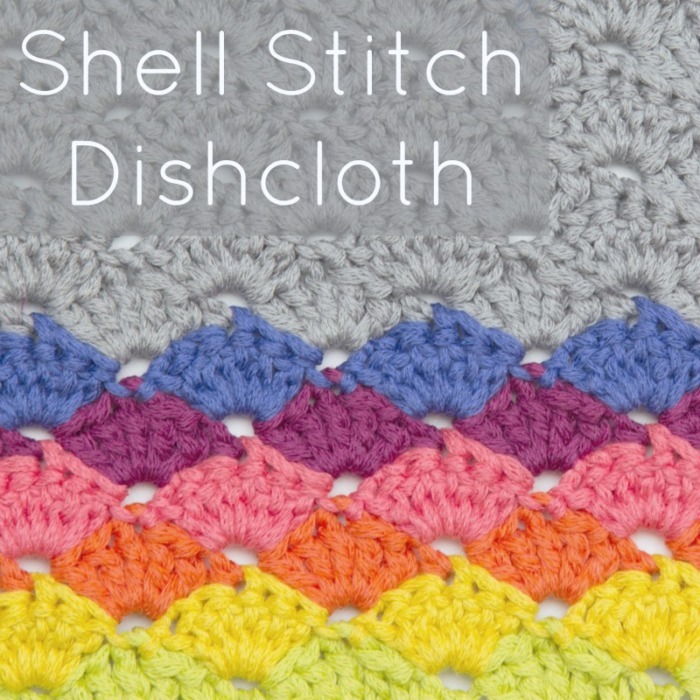 If you have any problems following the pattern, have a look at my photo tutorial for the Shell Stitch on Craftsy. Rows 3 – 16: Repeat Row 2, changing colour where specified in the list below. Please note that you do not have to change colours where I do. You are free to do whatever your heart desires! Fasten off and work away your yarn ends. 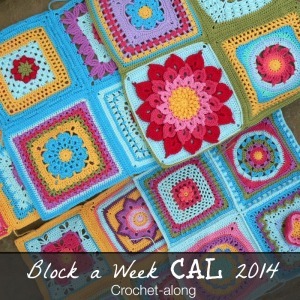 If you would like to change colours in each row, do so before you make the turning chain at the end of each row. Row 4: Geranium (408) – Scented Geraniums (Pelargoniums) are my favourite plant! 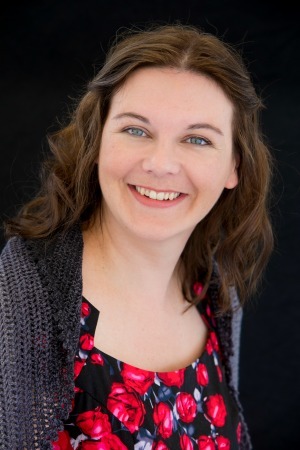 Because I just can’t help myself, I am going to include one more photo. It’s my nod to thunderstorms, rainbows, and the Karoo. 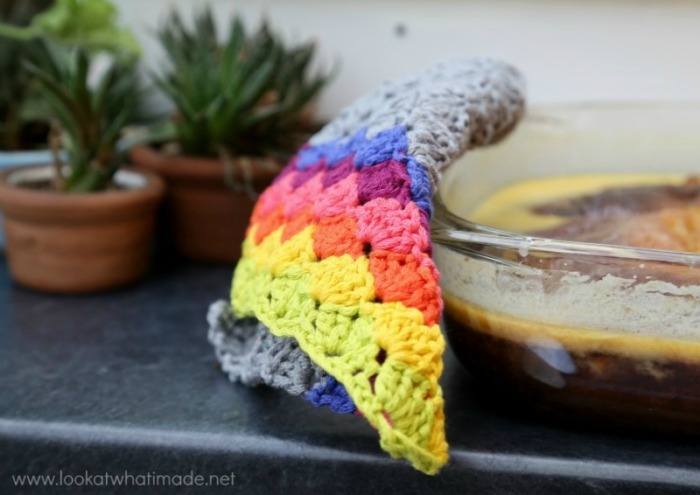 This is my tiny little Aloes, my Simple Crochet Shells Dishcloth, and a Malva pudding, which is a South African version of a sticky toffee pudding. 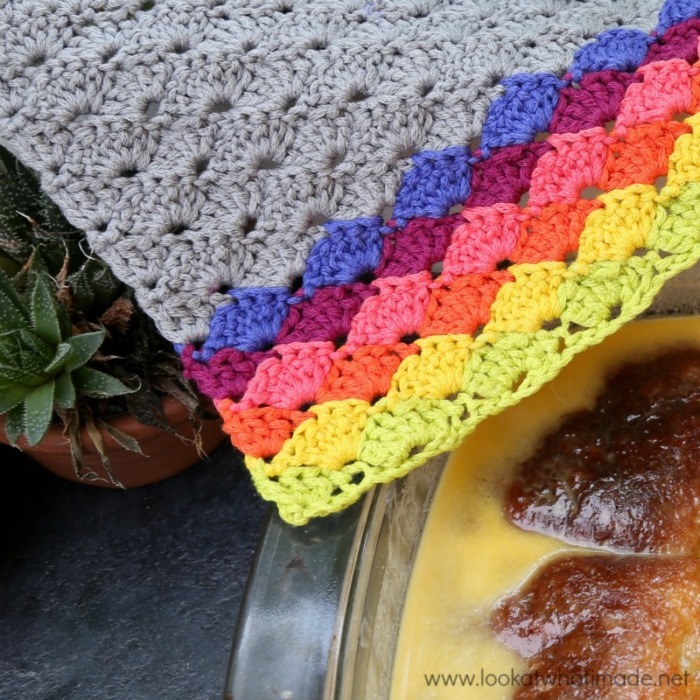 If you choose to make this dishcloth, please share some photos using #thunderandrainbowscrochet. Too pretty – going to use as a washcloth/spa cloth. Beautiful pattern! 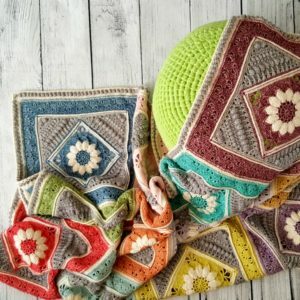 Could you expand on this to make it a blanket or baby blanket? Hi Peggy. Thank you. That is exactly what I was wondering when I made it, and I am trying to figure out how to best do it. The only problem, Dedri, is how could anyone USE such a beautiful dishcloth? I think I might save this one for “display” rather than actual work as it’s so pretty. 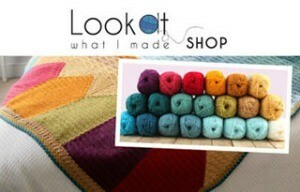 Thank you for the pattern, as always!